Mike Yang/Contributing Photographer Students gather on Friday evening to learn about organizing and advocating for change in higher education. Advocating for free tuition for all students enrolled in SUNY schools, two members of the New York Public Interest Research Group (NYPIRG) taught a group of Binghamton University students how to organize and influence higher education policy on Friday evening. The teach-in, titled “The Fight for a Free SUNY,” was provided by Emily Skydel, ‘13, a NYPIRG higher education affordability campaign organizer, and Smitha Varghese, chair of NYPIRG’s board of directors and a student at Queens College. Skydel said her student loans pushed her to become more politically active and ultimately led to her involvement in NYPIRG, where she advocates for changes in tuition policies. New York has drawn attention from higher education advocates for its tuition-free program, the Excelsior Scholarship, which was introduced by Gov. Andrew Cuomo in April 2017. Currently, only a certain subset of SUNY students qualify for the program, which stipulates that students’ families cannot have a combined annual salary of more than $125,000. Additionally, students must be New York residents, take 30 credits per calendar year and plan to reside in the state after graduation for the same length of time they participated in the scholarship program. Despite the Excelsior Scholarship, Skydel said education is still unaffordable for many students within New York. 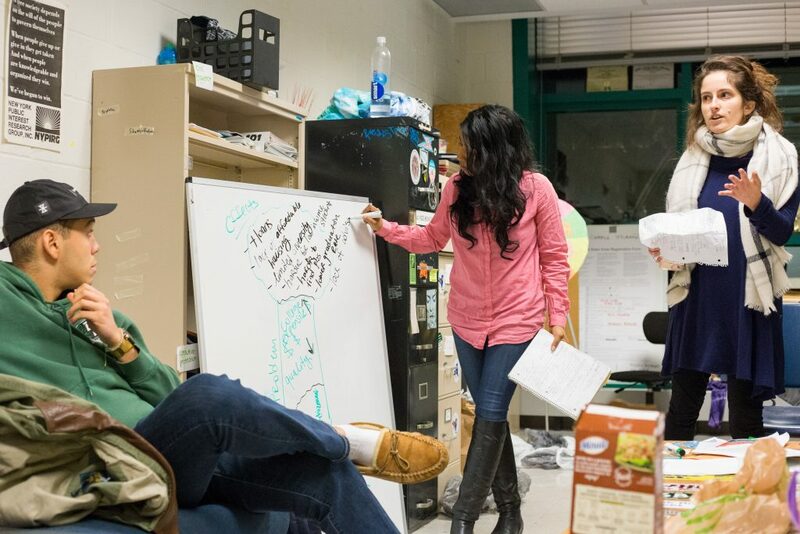 Skydel and Varghese drew a problem-and-solution tree to depict various issues with SUNY’s current tuition model and possible solutions to the issue. According to Varghese, corruption in state government and an overall lack of state funding are creating starved departments at SUNY schools, causing a drop in the number of full-time professors and advisers at colleges and universities across the system. Skydel and Varghese encouraged attendees to consider how current budgetary issues within the SUNY system impact the lives of students and overall tuition. Skydel said current policies will continue to inflate the cost of a college degree in New York, shifting the cost of a tuition-free program onto students without the Excelsior Scholarship, while restrictions on the program ensure it will only provide tuition-free college for some — mainly, middle-class New Yorkers not already receiving state or federal aid, such as Tuition Assistance Program (TAP) or Free Application for Federal Student Aid (FAFSA). After outlining their view of the problems plaguing higher education within the state, Skydel and Varghese discussed possible solutions to New York’s tuition issues. Some of the discussion revolved around the importance of voting and raising voter awareness. Skydel and Varghese also highlighted the impact of student action on SUNY campuses, encouraging BU students to table regularly and grow a movement. Ellie Plotkin-Kaye, president of BU’s NYPIRG chapter and a junior majoring in biology, said her organization regularly engages in this sort of grassroots organization. Plotkin-Kaye said the group plans to attend Higher Education Day, the largest union advocacy day of any student organization, in Albany in February. At the annual event, NYPIRG members aim to humanize the higher education issues that legislators vote on by providing faces to proposed policies. This year, many advocates at Higher Education Day will be stressing the urgency of pushing for a pro-student budget that decreases tuition costs and ensures higher education is accessible for students across the state. “If we believe that higher education is a right, because it’s an economic necessity, then it’s our job as advocates, as students, to make sure that every student has access to education,” Plotkin-Kaye said.